Connections DAILY is the ONLINE newsletter of ideas and images designed to help homilists develop their own brief reflections on the daily Gospel readings. For each weekday Gospel pericope, Connections DAILY provides an image or idea for a brief, one-to-two minute homily, concluding with a brief prayer that summarizes the point. The reflection/prayer usually centers on the day's Gospel, but occasionally is inspired by the first reading or the day’s feast or saint whose memorial is being observed. Because time is a factor at most weekday Masses, each Connections DAILY reflection focuses on a single point or idea, applicable to the common and everyday world of the parish community. Connections DAILY is available ONLINE ONLY: each week’s reflections are e-mailed to subscribers the previous week (sorry, Connections DAILY is NOT available in a hard-copy, “paper” version). Connections DAILY is sent in an easy-to-save-and-edit format, enabling you to “cut and paste” material as you need. Subscriptions to Connections DAILY are $54 per year. Take a look at Connections DAILY— a sampling of reflections is included below. If you preach — or have thought about preaching — a brief, meaningful reflection every day, Connections DAILY is the resource you’re looking for. CLICK HERE for subscription information and an order form . . .
A sampling of reflections from Connections DAILY . . .
We own many things – homes, cars, computers, televisions, audio equipment, sports gear of all kinds. But how much of that stuff owns us? Of course, things have to be maintained and cared for: the lawn won’t cut itself, we need to get out and play, and even a persnickety computer needs love now and then. But what happens when those things take over our lives, when we have no time or energy for family and friends (or God) because we have to make the house bigger and more beautiful, because we have to play on this team or belong to this club, because we have to see the latest movie? In today’s Gospel, Jesus speaks of “belonging” to what is below, of “belonging” to this world. God gives us his world not be owned by it but to experience in it the joys of this life and to use the blessings of it to sustain and nurture the lives God has given us. Free us, O Lord, from being “owned” by the things we own, of being “consumed” by the things we “consume.” This Lent, help us to “detach” from the things of this world in order to “attach” ourselves to your Spirit of compassion and peace in the world you have given us. According to the stories recounted in the Book of Genesis, he was probably a desert sheik, the leader of a tribe of nomads that wandered the region of what we know today as Persia some 3,000 years ago. At some point in his life, he had a profound religious experience. He came to a new understanding of the world: that there existed a unity in creation, a unity of humankind that connected everything and everyone to one God — not the mysterious vagaries of the nomadic system of many gods, but one God, the ultimate source of all that is good, the one God whose hand makes the sun and moon rise, who waters the fields with rain, who unleashes the power of the winds, who breathes life into every human body. This was God, Abraham discovered, who refused the offering of his most precious possession, his own son Isaac; instead, this was God who would create, through Isaac, a new nation of people that would be bound to God and to one another in love. As the father of Judaism, Abraham is our father in the faith, as well. May our Lenten journey reflect the desert journey of Abraham: that we may seek the God of compassion, the God of peace, the God of justice and always trust in his providence and mercy. God of Abraham, you revealed yourself to Abraham as the God of life and love: bind us together in your compassion and peace. God of Isaac, you spared Abraham’s son and made him a blessing for all nations; restore us to life in the death of your own Son. God of Jacob, you call us to be your people: make us worthy to be your sons and daughters. They paid [Judas] thirty piece of silver, and from that time on he looked for an opportunity to hand him over. Thirty pieces of silver. It is one of the coldest, most horrifying phrases in the Gospel. That Judas, who was one of Jesus’ most trusted friends, would sell him into death for thirty pieces of silver sickens us. Such greed, such callousness, such evil numbs us. Thirty pieces of silver — the price for doing away with Jesus. But truth be told, in our own lives, we do away with Jesus for even lesser amounts. We “sell” off God and the things of God for far less. We “sell” time with our families for a few extra dollars in overtime, for a promotion, for professional affirmation. We “sell” those we deem to be geeks and nerds into abuse and ridicule in order to protect our own false sense of superiority. We “sell” the poor into an eternal prison of poverty rather than part with a few pieces of our own silver. We “sell” any sense of a relationship with God for anything that is more profitable or more fun. True, we’re nowhere near as evil or as callous as Judas. But we have, at some time, collected our thirty pieces of silver. Open our hearts, O God of reconciliation to let go of the silver we stubbornly and greedily cling to. In this season of Easter transformation, refocus our vision in order to see you in every moment of our lives; re-center our spirits in your love that we may treasure the love of family and friends and look forward to bringing your love into the lives of the poor, the lost and the hopeless among us. They were the last two people on earth you would expect to be entrusted with such (literally) earth-shattering news. The two Marys of Matthew’s Gospel are simple, uneducated, peasants – and being women in a highly patriarchal society, they are all but invisible. Yet, because of their incredible compassion that brought them to the tomb early that Sunday morning, they become “apostles to the apostles,” announcing to Peter and the Eleven the news that Jesus had risen from the dead. Each one of us can spread the good news of the empty tomb – not by the rhetorical power of Peter in today’s first reading but by the simple love of the two Marys in Matthew’s Easter Gospel. Every act of selfless generosity, every offering of forgiveness, every expression of care and support “proclaims” the news that Christ is risen and walks among us. Go and tell Christ’s – and your – brothers and sisters the good news . . .
O God, in raising up your Son you have raised us up to new hope that our lives may be re-created in your love. Let every good thing we do for others be an Alleluia of thanks and praise for the possibilities we have to bring Easter hope to our brothers and sisters. And it happened that, while [Jesus] was with them at table, he took bread, said the blessing, broke it, and gave it to them. With that their eyes were opened and they recognized him . . .
A companion is someone we share an experience with, someone we travel with, someone we work with on a particular project. That definition is a prism for reading today’s Gospel. A small band of disciples have traveled with Jesus from the shores of Genesseret, journeyed with him on his teaching and healing missions, and accompanied him to Jerusalem for the final horrifying moments of Holy week. 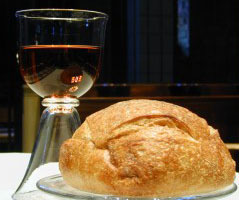 The two disciples in today’s Gospel, who believe that the story of Jesus is over, reconnect with their “companion” Jesus – in the breaking of the bread. In our own journeys to the many Emmauses we travel in our lives, Christ is our constant companion who makes his compassion and peace known to us in the Eucharist. In the bread of hospitality and generosity we receive and share, we become, in the Risen One, true companions to one another. Risen Jesus, open our hearts to recognize you in bread blessed and broken at our parish table and bread shared at our family table. May the sacrament of your Eucharist make us faithful traveling companions to you and to one another as we make our way together to the place you have prepared for us. Many homeowners and designers are committed to the concepts of recycling, restoring, and “repurposing.” Rather than throwing things out and buying new furnishings, every effort is made to “repurpose” old and used items. New paint, new fabrics, new appointments can give a second life to an old chair that may have a dated design but is solidly crafted. We have all become more and more aware of the need to recycle for the good of the environment: tons of materials – metals, chemicals, wood, plastics – once slated for landfills are collected and reused in new products and furnishings. In today’s Gospel, Jesus speaks of God’s relationship with us as one of “restoration”: God disposes of no one. God does not seek the destruction of those who fail to realize God’s dream of a humanity that mirrors his love. God always seeks reconciliation with his sons and daughters, to “restore” us to love, to “repurpose” us to lives of meaning and fulfillment. In his encounter with Nicodemus in today’s Gospel, Jesus speaks of God as a loving Father who created us and our world out of love and seeks to restore his beloved creation through an even greater act of love: God's becoming human himself in order that his beloved humanity might realize God's dream of becoming holy and sacred. Despite our own lack of confidence in things holy, despite our own rejection or obtuseness to the things of God, God is not satisfied with our struggling and dying in a junk heap but comes in the person of Christ that we may become the people God created us to be. O God, as you constantly seek to restore us to loving relationship with you, may we always seek to heal the brokenness in our own relationships with one another. Make us ministers of reconciliation; help us to become the means for restoring peace and re-creating existences of isolation and fear into lives of new meaning and purpose. It would never be enough. Oh, I could give a few dollars. I could give a few hours a week to help. But would it really make a difference? Whatever I have or could do would be a drop in the ocean. It wouldn’t really change anything. The need is too great for me to make a difference. But it would be enough – enough to make you a part of something good. It would be enough for one person to transform his or her life. It would be enough to express your gratitude to God for what you have received. It would be enough to change you. Jesus challenges Philip and his disciples to give whatever they can to feed the thousands who have gathered. The best they can scrounge up is a little boy’s lunch of a few pieces of bread and a few fish. It’s not much. But in Jesus’ hands, it’s enough to make a difference. The bigger miracle that day was not the feeding of the multitude but the disciples’ new hope in the possibilities of the simplest act of charity. Easter faith calls us not to seek results but to seek to act faithfully. Despite the odds against us, God calls us to act out of love, however inefficient and pointless it may seem. Father, help us to act first and always out of love. In imitating your Son’s selflessness and humility, may our most insignificant and hopeless offerings of generosity, consolation and forgiveness enable us to realize Easter miracles of resurrection and reconciliation in our home, school, church and community. What do you look for in another person? What qualities do you find attractive? What made you fall in love with your spouse? What do you find most welcoming, most appealing, most approachable in friends and colleagues? Kindness, certainly. Integrity to be sure. A sensitivity to the feelings and needs of others. Selflessness and humility. And not to be overlooked: a sense of humor. All these things that draw us to others are really the things of God. In the goodness of others we experience the goodness of God. God makes his presence known in every act of generosity, of selflessness, of courage. God “draws” us to himself in the compassion of others and draws others in our compassion. So may we look at others with the new eyes of Easter faith, to realize the talents and gifts they possess and to behold the goodness of God in them. Father, open our eyes to behold your presence in everyone and everything that is good. Teach us to re-create our homes and hearts in Easter hope; help us to become the bread of life that you have given us in the Eucharist of your Son. We’re going to have to let you go . . . The test results were positive . . .
We regret that we cannot accept you . . . Your application has been denied . . . Throughout our lives, we are knocked down, set back, driven to desperation. But as Peter has come to understand, the most important things in life are centered in the love of God. As Jesus teaches, the understanding and support, the forgiveness and healing provided by family and friends are all manifestations of God’s loving presence in our lives, enabling us to deal with the hard things and move on from the setbacks. Sometimes we are the recipients of such love and support – and sometimes we are the vehicles of that love. In every such moment, Christ speaks amid the “hard” words. May your words of life, O Lord, compel us to remain engaged in life when we are most overwhelmed, confused and scared. May your Spirit enable us to love and forgive when it is most difficult; may your Word guide us as we struggle and stumble along this road to your dwelling place. For any parent, there is nothing more terrifying than suddenly to discover that your child is missing. You are at the mall or the beach or the park – one moment your child is grasping at your pant leg; a second later the child is nowhere to be found. In your fear and panic, you shut out the every noise and distraction to focus entirely on finding your child. You run down aisles and alleys, questioning everyone, checking every possible hiding place. Nobody gets in your way; nothing slows you down. You focus like a laser for any glimpse of his baseball cap or her yellow sweater; you are tuned to hear only the words your heart aches to hear: "Mommy! Daddy! I got lost." In today's Gospel, Christ assures us that his voice can be heard above the noise and din of our lives, offering us peace, wisdom and guidance, if we listen purposefully and attentively. When our spirits ache over love that has been lost, when we lose our moral and ethical way, when we feel our footing slip beneath us as we try to navigate life's twists and turns, Christ calls us, his voice can always be heard if we listen with hope, with conviction, with faith. Like frantic parents desperately longing to hear their child's voice in the midst of our desperation and fear, the voice of Christ calls out to us, guiding us, supporting us, prodding us on our journey to the dwelling place of his Father. Good Shepherd, open our hearts to hear your voice amid the “noise” of our lives; guide our steps over the crags and rocky terrain we travel and bring us safely to the pasture of your wisdom and grace. Make us, in turn, selfless shepherds to one another, that we may walk together through the gate of your peace and compassion. Jesus goes to prepare a place for us in the dwelling place of God. A place for us: Whether we are rich or poor, a scholar or laborer, healthy or infirm, successful or struggling, every one of us has a place in God. A place for us: No matter the limitations we experience in the here and now, no matter our hardships in making a life in the present and with doubtful prospects for the future, no matter how badly we slip and slide on the road to eternity, a place awaits us. We don’t know the time; we can’t imagine what it will be like. But we have Jesus’ word: we have a place in God. So let us create a bit of heaven in the here and now by making a place for one another at our own tables and altars, in our own homes and hearts – just as Jesus has done for us all. Risen Christ, may your promise of a place for all in your Father’s dwelling place fill us with grateful hope as we journey to that dwelling place. Make us your ministers of reconciliation and compassion so that we may look forward to the place you have prepared for us in the next world by creating places of welcome and affirmation for one another in this world. Who rules you? What really sets the agenda for your life? How do set your priorities? How do you decide what gets done and not done in your busy days? Is it a paycheck? Is it the craving for attention and affection? Is it the need to be in control? Jesus warns us that after he takes his leave of the world, the “ruler” of the world will come. The first image we probably have is that of a powerful, evil force destroying everything in its path. But the force that “rules” our little world may be a far less dramatic, but just as destructive: the “rule” of self-centered greed, resentment, fear. Assured by Jesus of God’s grace, we can confront those fears and doubts and self-centered wants that “rule” our days in order to live our lives in the meaning and purpose of the Easter Christ. Lord Jesus, let your peace rule our days. May we seek your spirit of reconciliation and compassion in every time and place, in every relationship, in every decision we confront. In these few succinct words, Emily Dickinson captures the “joy” that Jesus speaks of in today’s Gospel: to discover our life’s purpose and meaning in the most ordinary and everyday offerings of compassion and comfort, of forgiveness and peace that we can offer. Today, do something meaningful and purposeful for one broken heart, for one hurting companion, for one fallen robin. O God, Creator of all that is good, may we know the deep joy and fulfilling happiness that is experienced only in loving others as you love us. Let us know that fulfillment and completeness of being your ministers of compassion and agents of your forgiveness. It’s gnawing at you. You know it’s wrong. You could have said something or done something. A simple mistake? An oversight? The heat of the moment? No, it was self-serving. It was thoughtless. And you know it. And it’s bothering you. Your regret and second-guessing of yourself is the Advocate Jesus speaks of in today’s Gospel. The Advocate prompts you to listen a little deeper. Listen beyond the regret. Pay attention to the light beyond the grief. The Advocate is leading you to a resolution, pointing you in the direction of reconciliation, revealing possibilities for putting things rights, for healing the broken, for making things whole again. The Advocate is light. The Advocate is hope in new possibilities. The Advocate is resurrection from what is dead and killing. Risen Lord, send your Advocate into our hearts and spirits so that we can transform the brokenness in our lives into wholeness, the doubt and inadequacy we feel into purpose, the hurt we have caused into reconciliation and healing. Every mother appreciates today’s Gospel. Pregnancy and birth are a rollercoaster of emotional highs and lows; it is a time of experiencing both fear we never could imagine and the greatest joy possible; we confront both the inadequacies of our abilities to raise a child ourselves and our optimism for our new family. Parenthood is to live the Christian paradox of the anguish of the cross and the hope of the resurrection. We cannot have one without the other. We cannot give life unless we are willing to experience some change, some “death” within ourselves. Jesus challenges us to embrace an “attitude of resurrection,” that sees the hope and possibilities once we conquer the challenges and suffering of the cross. Father, transform our hearts in the hope of your Son’s resurrection, so that we may take up our crosses, despite the suffering and hurt they entail, and realize that they can be the means for new birth, for new life, for new creation as we make our way to the eternity of your time and place. No one of us discovered God on our own. No one comes to Jesus because they read his biography and decided that Jesus is the Savior. Nobody can experience the Spirit of God in their lives alone. No, every one of us came to believe in Jesus because of people we love and trusted love and trusted Jesus. We discovered the love of God in their love for us. Chapter 17 of St. John’s Gospel is a prayer that Jesus offers just before departing for Gethsemane on Holy Thursday night. Jesus begins with praying for his disciples to whom he has entrusted his Gospel of reconciliation and peace. He asks God to bless the ministry they will soon begin. That ministry has continued through the centuries every time some parent teaches their child how to pray, every time a teacher helps a student understand a Gospel story, every time someone tells a friend how God helped him transform his life. Today, give thanks for those who helped you discover God and God’s love in your life – and return the favor by sharing that same Word with someone you love. Lord Jesus, as we have come to you through the love and inspiration of parents and friends, of pastors and teachers, may others now come to know you and your transforming love through us. By your grace, may we become reflections of your love and vehicles of your forgiveness, for our broken world. Today’s Gospel is one of the most touching episodes in John’s Gospel. Appearing to the Eleven after his resurrection, Jesus asks Peter if he loves him. Peter answers that he does. Jesus asks a second time, and again Peter proclaims his love for Jesus. A third time Jesus asks and, Peter, his voice rising, assures Jesus that he loves him. Only a matter of days before, Peter denied even knowing Jesus. But rather than confront Peter over his denial, Jesus offers Peter the opportunity to be reconciled with Jesus – and with himself, to get beyond his own sense of failure and disappointment with himself. In forgiving Peter as he does, in affecting reconciliation with Peter, Jesus transforms Peter’s regrets and shame into a new understanding and conviction of the Gospel the fisherman has witnessed. Today, find some way to enable someone to be reconciled and “made whole” in spirit, enabling that person experience a sense of “resurrection” in his or her life. O Risen Lord, make us your “fishers” of humanity: to seek re-birth rather than condemnation, to rejoice in reconciliation, “feed” one another with your bread and fish of compassion and peace.